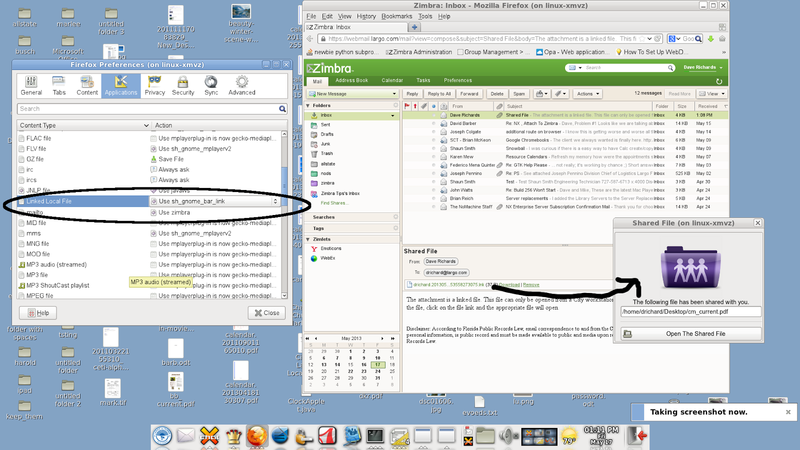 I have been unhooking the last bits of software applications that were connected to Evolution and making them work with Zimbra. I finished all of the places that allowed users to "attach" a file with the drag and drop technique described a few blogs ago. Next up was the feature that allowed them to create a file:// link inside of their email. This was used in order to try and get people to "share" files and not send multiple copies of the same file around the network via email. We're all on the same server, so there isn't ever really a need to send a file to another user inside the City...it's already here and centralized. But many people still are thinking in terms of a PC or USB sticks and feel like that's how you get files from one person to another. The file:// link was available inside of Evolution, but is now considered an exploit and not really used in browsers anymore. We wanted to replace the functionality however, so I found a solution and it's being tested. I created a new MIME type for files that end with '.lnk" inside of Firefox. Inside of this file is the path to a file located internally. 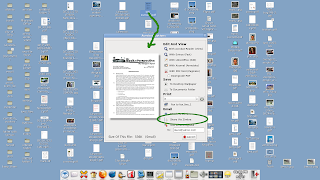 The user is then able to open these linked/shared files without physically sending a copy. This too is very quota friendly. 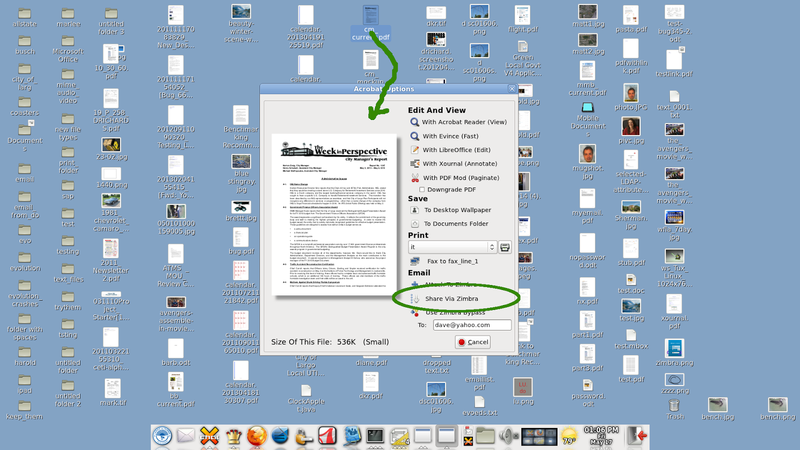 When users double-click on the file, the normal MIME UI appears. 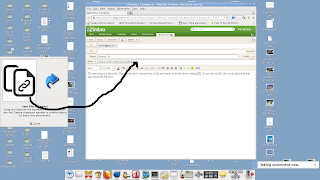 The option circled in green is "Share Via Zimbra"
Using the same UI that was used to solve the LibreOffice temp file issue (described two blogs ago), a link symbol appears. User drags this into their composer window and a .lnk file is attached. 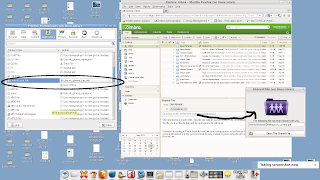 The recipient then clicks on the .lnk file and a box appears alerting them that a file has been shared, and then once opened the appropriate helper application (Evince, Acrobat Reader, LibreOffice, EOG, GIMP) opens based on the file type. 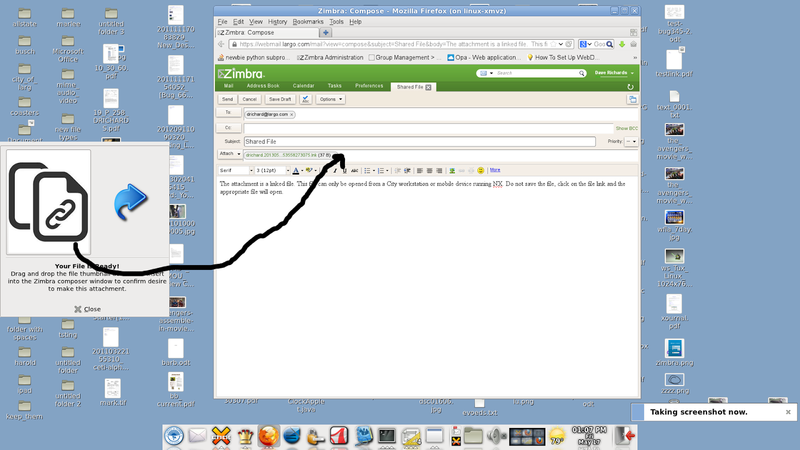 I also have circled the new MIME type as it appears in Firefox. I am logging when users perform this step and it's already being used around the City. This seems to be the simplest way to solve this problem, and hopefully will get more people to begin sharing files until we can move in the direction of a proper document management system. We did not change anything on the desktop. Still using GNOME + avant-window-navigator. FileLoby - Free File Hosting , Simple free file hosting.